From the makers of the world's best frozen foods, this fresh seafood and algae mix is a gour.. Excellent flake diet for both herbivorous marine and freshwater fish. This algae boosted diet tar.. Excellent flake diet for both herbivorous marine and freshwater fish. This algae boost.. If ingredients such as salmon, brine shrimp and krill were not enough, we’ve added Spirulina to t.. 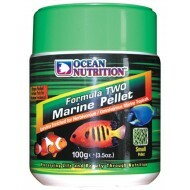 This brine shrimp based flake is supplemented with a nutritious blend of seafood, plankton, algae..